Our business is MGF and MG TF spare parts, whether they be new MGF or MG TF parts that were never used at the factory, pattern, re manufactured or upgraded parts. They are available to collect directly from our shop or available online by mail order. 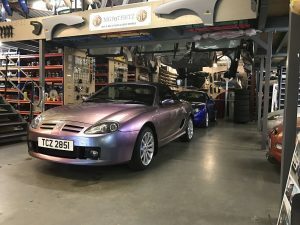 The MGF and later MG TF are mid-engined, rear wheel drive roadster cars that were produced by MG from 1995 until 2005, and by MG Motor from 2007 until 2011. Production of the MG TF paused in 2005, when MG Rover went into receivership, and resumed in 2007 under the company’s new owners Nanjing of China. This makes the cars increasingly more valuable and collectible, especially if you have a MGF or MG TF in good condition. We aim to keep you car in pristine condition by bringing you the very best new and used spare parts for MGF and MG TF cars.